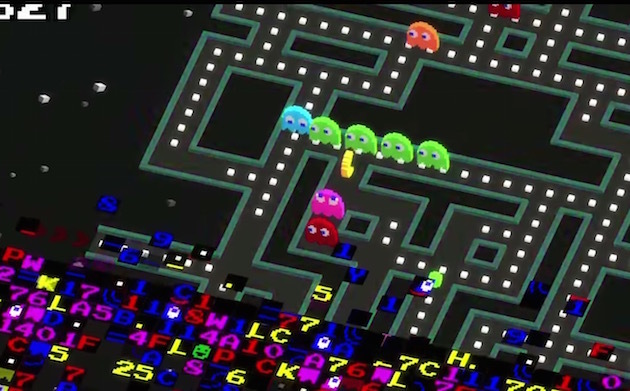 Based on the infamous glitch that early gamers faced on getting to the 255th stage of the original Pacman, Pacman 256 is a strange blend of Crossy Road and the arcade classic. That’s no accident, of course, with Hipster Whale, the developer of the massive mobile hit Crossy Road, at the helm here and Namco overseeing the end result. The two gel surprisingly well. On the one hand you have the classic Pacman game, which needs little in the way of introduction, ingrained as it is in modern culture. The maze you start with is familiar and everything seems normal, bar the odd (but pleasing) 2.5D style of the graphics. As you make your way downwards to the bottom of the screen (and you really should do this first) strange coloured alphanumerics start to take over, rising from the depths like demonic alphabetti spaghetti. This is the glitch, the bad coding that marked the 256th level of the original. It slowly rises to engulf the screen unless you push upwards towards the top of the maze, though it still follows behind like an avalanche of bad text. The second change comes in the form of an endless scrolling maze. The top of the traditional first Pacman stage is replaced by new mazes, tacked on to the top of the old one in one seemless huge map. Traditional side exits are still present but become more of a threat as the need to scroll upwards rather than sideways pushes the player into calculated risks to gather more pellets, fruit and power-ups such as lasers that can fry any ghost that gets in their way. This being a Crossy Road sequel, the endgame is all about the score and Social Network integration means that you can instantly goad other players into having just one more go to beat your latest achievement and wipe the smug look off your face. As with Hipster Whale’s other game, coins are also earned to unlock continues and weapons and no-doubt other items, such as new graphics, will be made available in later updates. In a world of shameless pay-to-play games Pacman 256 keeps it simple, though adverts are provided as you unlock more items. This keeps the ads from interrupting the main game and puts the player in control of facing them. It works surprisingly well while still possibly bankrolling the whole endeavour for both publisher and developer.